Ann Wass (email: annbwass@aol.com) has a Ph.D. in costume and textile history. She is a historian at the Federal era Riversdale House Museum in Riverdale Park, Maryland, and enjoys sewing Regency clothing for her husband and herself. She belongs to the Costume Society of America as well as to JASNA. Lady with a Red and Blue Sewing Bag, c. 1815. © National Gallery of Art. on 1 Septeber 1796, Jane Austen wrote to her sister, Cassandra, from their brother Edward’s house, “We are very busy making Edward’s shirts, and I am proud to say that I am the neatest worker of the party.” Before the invention of the sewing machine, all sewing had to be done by hand. While some tasks were left to professionals, the sewing of mothers, sisters, and daughters was a significant contribution to the household. Both letters and diaries suggest that women’s hands were seldom idle as they “sat at work,” that is, sewed garments for themselves and their families and mended them as they showed signs of wear. This work, stowed in work (or sewing) bags, was portable and could be carried around the house or even taken out visiting, allowing women to be productive while they chatted. Women, including Jane Austen, recorded doing needlework in letters and diaries. Noblewomen were no exception: Several times in 1799 and 1800, Anne, the Countess Dowager of Roden, wrote in her diary that she “worked” or “sat at work” (45, 65, 88, 91). Much of this “work” was plain sewing—that is, making the family’s body linen, or those garments that were worn next to the skin, such as men’s shirts and women’s shifts, as well as household textiles, such as sheets, towels, and tablecloths. These items were generally made of white linen (hence the term “linen” for both undergarments and household textiles) or, as the nineteenth century began, cotton. Amanda Vickery writes that the cosmopolitan Anna Larpent’s “domestic employments” included “cutting out shirts and shifts, knitting, [and] looking over household linen” (157). While the provision of household textiles was also important, the focus of this essay is the clothing that a variety of British and American women at the turn of the nineteenth century provided for themselves and their families. As shirts and shifts did not require close fitting, these were relatively easy to cut and sew, and the average home seamstresses could make them. Even philosopher Mary Wollstonecraft conceded that for a woman to make clothes for her family was “her duty, this is her part of the family business” (125).1 In addition to working on shirts for Edward, Jane Austen also made shirts for her brother Charles, a lieutenant in the British navy who was about to go to sea. She wrote on 1 November 1800, “I have heard from Charles, & am to send his shirts by half dozens as they are finished;—one sett will go next week.” Shirts and shifts were constructed of geometrically-shaped pieces, primarily triangles and rectangles, and women cut several garments at once to make the best use of a long length, or piece, of fabric. It would not be uncommon to make shirts “by half dozens.” We can infer that Charles was to receive a dozen and a half shirts or more, as he was likely to be at sea for a long time. Sewing must often have been a valuable contribution to the household. Dorothy Wordsworth, sister of the poet William Wordsworth, kept house for him while they lived in Grasmere from 1799 to 1808. For the first few years, they lived in straightened circumstances. Dorothy recorded her sewing and other domestic chores in her journal. In 1802, she “worked at Montagu’s shirts” (98). Basil Montagu, Jr., was William Wordsworth’s ward. Young women were often tasked with plain sewing for family members. Harriet Manigault of Philadelphia had little time to prepare after her brother joined the militia during the War of 1812: “Charles went to town on Saturday morning, & when he came up in the afternoon he told us that he had joined the Washington guards, & must soon leave us: he is now preparing to go to Camp, & we are all busy making shirts for him of check” (25). As a member of the militia, Charles Manigault likely had to supply most of his own clothing. Once she was married, she would, of course, have to sew for her husband. She did have “second thoughts” about having this theoretical husband sew for himself: “I think if I had a husband that I loved, I would never set him work” (281). It appears that women visiting with friends often contributed their sewing skills to the household. 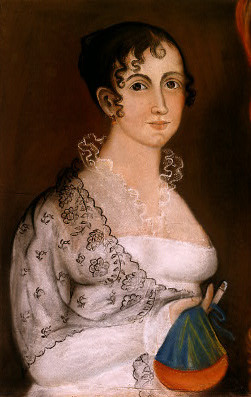 Ruth Henshaw of Massachusetts, prior to her marriage to Ezekial Bascom, spent several months in 1801 and 1802 with the Harris family in Norfolk, Virginia. While they were not relations, she nevertheless made herself useful by sewing for them as well as for herself. For Mr. Harris, she “Began to make a new piece of holland 7/6 pr yd. into shirts” (318) and reported two subsequent sewing sessions before finishing the first shirt eight days later (318-21). (Holland was fine linen so named because it often came from the Low Countries. While United States currency was dollars and cents, prices were still often expressed as shillings and pence.) Ruth also “made Jim a Shirt” (293). Jim was one of the Harrises’ enslaved workers. She made “two Russia duck shirts”: Russia duck was a coarse hemp fabric, so these were probably also for enslaved workers (289). The sewing of women who lived on plantations in the southern United States was perhaps even more important than that of their sisters elsewhere, as the plantation was a center of clothing production for both family and slaves. Frances Baylor Hill, who lived on the Hillsborough plantation in Virginia, seems from her 1797 diary to have been a prolific seamstress. She did plain sewing, dressmaking, and tailoring. Among her projects were shirts for male family members, and her daily entries shed light on the process of making them. One day in February, she “stitch’d a pair of risbands and set them on.” (She does not mention cutting out the shirt; perhaps someone else in the family did that.) The next day, after having sewn the “risbands” on them, she “finish’d the shirt sleeves.” Two subsequent days she “sewed a little on the shirt.” Then she “stitch’d the sholder stapts [reinforcing shoulder pieces, or straps] on a shirt and gatherd the colar.” The next day, she “set on the colar and set in the sleeves of the shirt” (14-15). A week or so later, she “cut 4 shirts” and first “stitch’d one ristband,” and the next day stitched “3 ristbands made buttonholes and set them on,” suggesting that she again made the sleeves first (17). Later in the year, she worked on another shirt, “noting [knotting?] and seting on the frill” that adorned the front slit (42). Women might also take family work with them to do while away from home. Harriet Bradley of Watertown, Connecticut, kept a diary in 1819. She was single and lived part of the year with her parents and part of the year away from home while she taught school. But whether at home or away, she also worked on shirts for three of her brothers. For example, she “finished a shirt for Marcus, went home,” “Made 2 shirts for Lucius,” and “Made 1 shirt for Phinehas” (3-5). While matters of fashion were more likely to concern women, there were also significant changes in men’s fashions during this period. Maria Josepha, Lady Stanley, was making shirts in 1800 and wrote her sister with a question. “Pray, is it the fashion for the shirt collar to stand as high as the corners of the eyes? for it is of consequence I should be informed before the new set I am making is finished.” Her sister replied, “I inquired of William respecting shirt collars, upon which he only made a violent philippic on the folly of man’s dress at present, and did not seem to know anything about the matter” (193). Evidently Lady Stanley wanted to be sure the shirts she made were the latest style, despite her brother-in-law’s “philippic” regarding what some saw as an exaggerated fashion. The woman’s equivalent of the shirt was the shift, similarly constructed of geometric shapes cut from linen or cotton and often made in quantity. On 25 November 1798, Jane Austen wrote, “The Overton Scotchman has been kind enough to rid me of some of my money, in exchange for six shifts and four pair of stockings. The Irish is not so fine as I should like it.” That is, she bought enough Irish linen to make six shifts, and since we know she made men’s shirts, she likely made her own shifts, as well. Dorothy Wordsworth also made herself shifts, among her other sewing chores. One Saturday in 1800, she wrote, “after tea worked at my shifts in the orchard”; the following Tuesday, she “sat on the wall making my shifts till I could see no longer” (35). She probably had better light outdoors than inside her home, Dove Cottage. It was common practice to mark both personal and household linens. This marking was done with colored thread using a small cross stitch, also called a marking stitch. It usually consisted of initials and a number. As shirts or shifts were often nearly identical, the initials allowed different members of the household to distinguish their garments. It has been suggested that the numbers served both as a form of inventory control and, especially for household linens, a way to make sure they were rotated in use. Marking also identified a family’s items if they were sent out to a laundry to be done, as was often the case for urban households. A few months before she died, Jane Austen wrote, “I have contributed the marking to Uncle H.’s [her brother Henry’s] shirts” (20 February 1817). Frances Hill “mark’d a shirt,” but it is not clear if it was one that she had just made (15). Rachel Van Dyke wrote, “Besides my other work, I marked three cravats. And twelve letters and three figures on fine cambric muslin to those who have tried it, is no such easy matter to do without resting” (27). She must have put four initials on each cravat, or neckcloth. 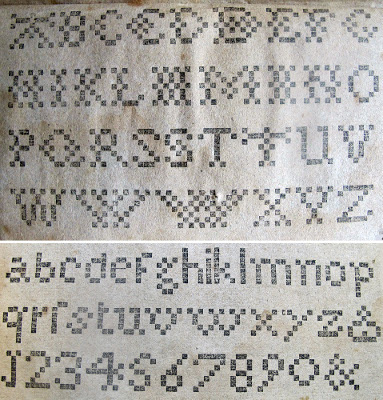 Two of her brothers shared the same first initial, so she may have felt the need to include both the first and middle initials, as well as “V D” for Van Dyke.” The marking stitch was done much in the manner of what we today call counted cross stitch, with the stitches crossing the intersection of warp and weft threads. This task would, as Rachel wrote, have been more demanding on cambric muslin, which was woven from fine cotton yarns, than on a more coarsely woven linen fabric. The illustration below shows diagrams for the “great letters and small; likewise the figures” for marking linen (Fisher 330). The American Young Man’s Best Companion (pages 331-32). Dresses were more difficult to make than shirts and shifts. The cutting and the fitting of the bodice particularly demanded skill. (The skirt was usually more simply constructed of straight or slightly shaped panels of fabric.) Women therefore often left this task to professional dressmakers, sometimes referred to by the older term mantuamaker. 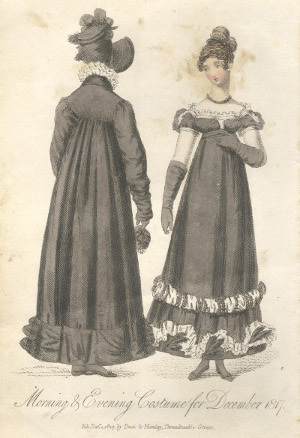 It appears that the Austen sisters rarely, if ever, made their dresses. Other women, however, did make dresses for themselves and family or friends. Frances Hill seems to have sewn for several women. One day she “pleat’d Mrs Rows gown and baist’d the tail [skirt] to the body [bodice]” and two days later “finish’d Mrs Rows gown” (8). She also made “a frock” for Louisa Hill, a dress for Polly Smith, and a dress for “Maria” (13-14). Rachel Van Dyke preferred to make her own clothes. She wrote, “The mantuamaker was here this week and made Lydia’s, mama’s and aunt’s dresses but did nothing for me. Indeed, if I had nothing else to do, I would prefer making my own clothes—for no one can suit me as well as I can suit myself” (112). Previously, she had made a “pink frock” she liked so well that she decided to make a white one, too (32). The silhouette of women’s dresses changed at the end of the eighteenth century, and keeping up with the new fashions could be challenging. Some clever women were able to copy new styles from borrowed garments. Frances Hill “began to cut out the girls muslins by a new dress of Mrs. Legars, [and] cut them both out” (36). In 1800, Anna Maria Thornton wrote, “I sent ‘Joe’ to Mrs R. Forrest to borrow a new Gown to look at” (93). Some thrifty seamstresses altered their existing clothes to be more in keeping with the new styles. One of the major changes was that skirts became more slender, and Ruth Henshaw “altred my white pett[icoats] by making them narrower” (304). She also “began to alter my plad callico” (301) and “altr’d my blue muslin gown” (305), but she did not describe these alterations. In 1796, Charlotte Sheldon of Connecticut “Began to alter my muslin into a robe which is the most fashionable dress in Hartford,” finishing it a few days later (12). When the fashion changed, Jane Austen suggested that Cassandra could update some of her dresses by adding flounces around the hems: “You really must get some flounces. Are not some of your large stock of white morng gowns just in a happy state for a flounce, too short?” (14 October 1813). Another way to update a garment was to take it completely apart and re-make it. Charlotte Sheldon “Riped [ripped] my gown which I am going to have altered” (16). Frances Hill “rip’d up a gown for Cousin Susan & began to alter it.” Two days later, “Cousin Agness & my-self rip’d up two gowns of Cousin Walkers to make, Polly & Franky Walker, dress’s to wear to A Tompkins’s wedding” (44). following the death of Charlotte, Princess of Wales. Dean & Munday, London, December 1817. Jane Austen, too, wrote of the need for mourning attire. Sometimes, though, this work was not for a death in her family but rather in response to court-ordered mourning. While it was not always mandated for those not at court, many others chose to follow suit. In 1814, Austen wrote of “this 6 weeks mourning” for the Queen’s brother, the Duke of Mecklenburg-Strelitz. Instead of having a new dress made, she “determined to trim my lilac sarsenet with black sattin ribbon” (5-8 March). Women also made themselves small items that were relatively simple to sew. Jane Austen wrote to her sister in 1798, “I have made myself two or three caps to wear of evenings since I came home.” As an unmarried woman just turning twenty-three, she would not necessarily have felt obliged to wear caps, but, she explained, “they save me a world of torment as to hair-dressing” (1-2 December). In 1804, Agnes Porter, a governess who was on leave visiting her family, wrote in her diary, “Very busy at home—with my dear sister’s help making up caps and other necessaries. It seems rather a treat for me to be only busied about myself” (233). Her diary makes it clear that, as a governess, most of her days were taken up with her charges. Mary Shelley’s stepsister, Claire Claremont, seems to have been more interested in reading and other intellectual pursuits than in sewing, but even she made “a Cap” one rainy October day (251). Harriet Bradley “made me an apron,” “made a night cap,” made handkerchiefs for herself and “PB,” and “made a work bag for Mrs. Wetlon” (1-5). In addition to her larger projects, Frances Hill “hem’d a handkerchief for Miss Amy Smith,” “cut out a piece of linning [linen] and sew’d on Mama’s apron,” “finish’d Mrs Tu–lls [Tunstall’s] apron,” and “made Mama 3 caps” (8, 11, 12, 16). Over the course of several days Ruth Henshaw made several “cambrick handkerchiefs” and a “pair of nankeen mittens to wear in the house” (282, 284, 287). Men’s tailored garments, such as coats and breeches, were rarely made at home. Most men relied on professional tailors who had the expertise to cut the complicated garment pieces to fit the body and do the specialized construction. Sometimes, however, women of the family did make menswear. Frances Hill, who appears to have been a skilled seamstress, recorded making tailored garments. It is also possible that there was no tailor within a reasonable distance of the Virginia plantation where she lived. She made breeches for Edward (perhaps her brother) and for her “Papa” (17, 32-33). In November, she “cut out Edward’s Winter cloaths.” She evidently made two full suits, including breeches, coats, and waistcoats. Shortly after cutting, she “finished a suit of E. Hills cloaths” and “began an other suit of cloaths.” In early December, she “finish’d Edwards’s waistcoats & Breeches” and then “began E. Hills Coat” (48-49). Waistcoats were not as difficult to make as coats and breeches. Dorothy Wordsworth recorded in November 1801, “Mary was making William’s woollen waistcoat” (71). (Mary Hutchinson was the Wordsworths’ friend, who later married William.) The next day, Dorothy evidently helped Mary, as “we were making his waistcoat” (73). And Mary later continued “at work at Wm’s warm waistcoat” (75). Women protected their investment of both time and money in the family’s wardrobe by mending garments as they became worn. Governess Ellen Weeton mentioned in letters that “I find it is almost as much as I can do, to keep my clothes in repair” and that “the little time I have to myself, is a good deal employed in repairing my clothes” (67, 87). She wrote in her journal years later, in the hope that her daughter, Mary, would read it, “I have, for some years, entirely given up all kinds of needlework which has no real utility to recommend it. . . . When I sew, it is to make necessary clothing, and to keep it in repair. . . . I keep my apparel in the exactest repair” (396). Dorothy Wordsworth “mended old clothes” (20). Frances Hill “mended Brot Billys breeches & Papa drawers” and “mend’d Jack Tu–lls [Tunstall’s] coat” (11, 17). Mothers can relate to Mary Boardman Crowninshield, who was living in Washington, D. C., with her two young daughters during the winter of 1815-16. She wrote to her mother that “I arose earlier this morning to mend the girls’ gowns. 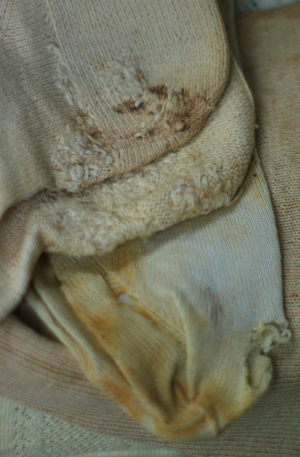 The bottoms of the sleeves were worn out” (50). Ruth Henshaw “mark’d & mended for Wm” (292). William was her host’s brother, who was visiting. from the collection of Carol Kocian. Ruth Henshaw “mended silk st[ockings]” (285), and Frances Hill “darnd my stockings” (7). Dorothy Wordsworth recorded mending stockings four times, including one “very cold and cheerless morning” in May 1802 (138). Nineteen-year-old Harriet Wynne lamented in her diary in 1805, “Of all miserable dull days this was the worst—I mended 12 pair of Stockings holes as large as my head” (180). While Jane Austen seems to have been typical of her contemporaries in sewing for herself and her family, she does not tell us a great deal about the needlework of her female characters. To be sure, on a visit home, Fanny Price found her brother Sam about to go to sea, as two of the Austen brothers did. She is “very anxious to be useful” and “therefore set about working for Sam immediately, and by working early and late, with perseverance and great dispatch, did so much, that the boy was shipped off at last, with more than half his linen ready” (MP 390). 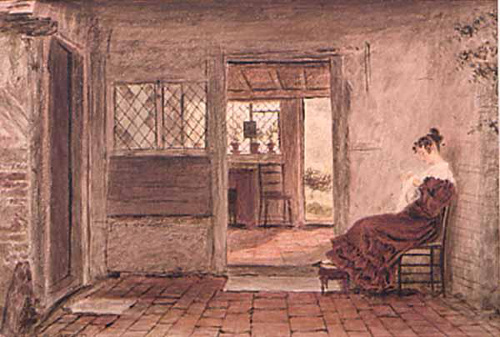 Near the end of Pride and Prejudice, an anxious Elizabeth Bennet sits “intently at work” when Bingley and Darcy visit Longbourn after a long absence. She “said as little to either as civility would allow, and sat down again to her work, with an eagerness which it did not often command” (335). Perhaps few of Austen’s women were eager to sit down to their work? That real women wrote about their sewing, including the mundane and sometimes even unpleasant chore of mending, suggests that they saw these tasks as an important part of their lives. Jane Austen, Mary Boardman Crowninshield, and Ellen Weeton all described their sewing in letters to family and friends. The diaries of Ruth Henshaw Bascom, Harriet Bradley, Frances Baylor Hill, Rachel Van Dyke, and Dorothy Wordsworth give an idea of the ubiquity of sewing in the daily routine. As most clothing could not, as Jane Austen noted, “be bought ready made” (24-26 December 1798), the work of women’s needles was indeed an important contribution to the household. William Henry Hunt, Cottage Interior with Girl Sewing, c. 1828. Image Courtesy of Manchester Art Gallery. 1. The author thanks the reviewer who called her attention to this passage by Mary Wollstonecraft in Susan Allen Ford’s essay “‘To be above Vulgar Economy’: Thrifty Measures in Jane Austen’s Letters.” Persuasions 30 (2008): 216-21. Bascom, Ruth Henshaw. “A New England Woman’s Perspective on Norfolk, Virginia, 1801-1802: Excerpts from the Diary of Ruth Henshaw Bascom.” Ed. A. G. Roeber. Proceedings of the American Antiquarian Society 88 (1978): 277-325. Bradley, Harriet. “Diary: Harriet P. Bradley.” Old Sturbridge Village Education Packet, “Growing Up in Early 19th Century New England.” Sturbridge, MA, n.d.
Claremont, Claire. The Journals of Claire Claremont. Ed. Marion Kingston Stocking. Cambridge: Harvard UP, 1998. Crowninshield, Mary Boardman. Letters of Mary Boardman Crowninshield 1815-1816. Ed. Francis Boardman Crowninshield. Cambridge: Riverside, 1935. Hill, Frances Baylor. “The Diary of Frances Baylor Hill of ‘Hillsborough’ King and Queen County Virginia (1797).” Ed. William K. Bottorff and Roy C. Flannagan. Early American Literature Newsletter 2 (1967): 3-53. Manigault, Harriet. The Diary of Harriet Manigault 1813-1816. Rockland: Maine Coast Printers, 1976. Porter, Agnes. A Governess in the Age of Jane Austen: The Journals and Letters of Agnes Porter. Ed. Joanna Martin. London: Hambledon, 1998. Roden, Anne. The Diary of Anne, Countess Dowager of Roden. Dublin: White, 1870. Shelley, Mary. Mary Shelley’s Journal. Ed. Frederick L. Jones. Norman: U of Oklahoma P, 1947. Stanley, Maria Josepha. The Early Married Life of Maria Josepha Stanley, with Extracts from Sir John Stanley’s “Praeterita.” Ed. Jane H. Adeane. London: Longmans, 1899. Thornton, Anna Maria. “Diary of Mrs. William Thornton, 1800.” Records of the Columbia Historical Society 10 (1907): 89-226. Van Dyke, Rachel. To Read My Heart: The Journal of Rachel Van Dyke, 1810-1811. Ed. Lucia McMahon and Deborah Schriver. Philadelphia: U of Pennsylvania P, 2000. Weeton, Ellen. Miss Weeton: Journal of a Governess 1811-1825. Ed. Edward Hall. London: Oxford UP, 1939. Wollstonecraft, Mary. A Vindication of the Rights of Woman: With Strictures on Political and Moral Subjects. London: Unwin, 1891. Wordsworth, Dorothy. The Grasmere Journal. New York: Holt, 1987.